Since the 2011 Japan Fukushima Dai-ichi nuclear disaster, Seagate has been carefully monitoring the production of Seaweed Powder for any levels of radiation. Of primary concern is the possible presence of radioactive isotope Iodine-131. Federal FDA standards for food products allows a max level of 170 Bq/kg. Seagate harvests their seaweed along the Pacific Coast of Baja California, 10 miles north of the City of Ensenada. Although this is far from Japan, there still exists the possibility of radiation contamination reaching this coastline and contaminating marine life. In order to prevent any possible contamination of our seaweed product, Seagate has been testing all production batches for radiation at an independent lab since 2011, prior to releasing them for bottling. The independent laboratory found no detectable levels of any radiation contamination in Seagate’s Seaweed for either year for all isotopes tested. The results were zero, below any detectable levels for the laboratory’s equipment. 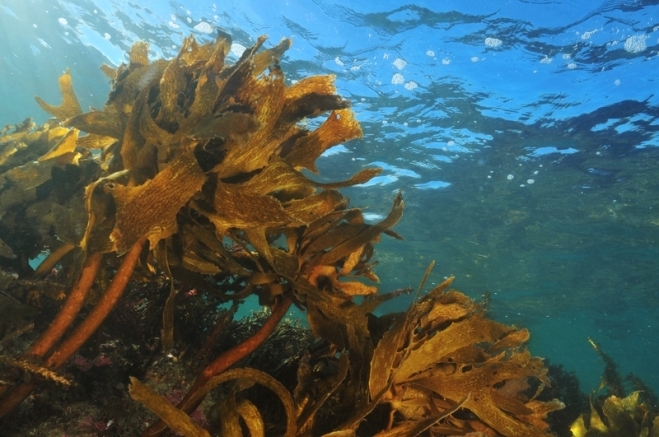 Seagate will continue to monitor and test each new production batch of seaweed before it is released for bottling. These reports are forwarded to the California Food and Drug Administration. 1) Ensenada is located more than 10,000 miles away from Japan. The dilution effect of such a large ocean would make the concentration of any irradiated seawater almost non-detectable along the Baja California Coast. 2) Seaweed is at the bottom of the food chain. Any contamination whether by radiation, heavy metals, dioxins or PCB’s are usually not measurable at this level. As you move up the chain to small fish like anchovies, then to mackeral, sharks and tuna, the potential for concentration will multiply by a factor of 10X at each higher level. 3) Probably the most important factor of all is the combination of the “Corriolis Effect” and the resulting upwellings along the Pacific Coast. In the Northern Hemisphere, as the California Current moves south from Alaska to Mexico, the rotation of the earth will cause it to bend to the right, which is away from the coastline. This movement of the current towards the center of the Pacific drives any of the original contaminated water away from the coast and into a”dead zone” thousands of miles away. By causing this current to bend away from the coast, the Corriolis Effect also causes the nutrient-rich bottom waters to surface along the coast in areas of upwellings. These bottom waters from thousands of feet of depth rising from the ocean’s bottom are still almost pristine and have no radiation contamination … so far. This protection may last for many more years. No one knows for sure. It can also become permanent if Japan is finally able to stop the release of the tens of thousands of gallons of contaminated seawater still flowing out of their damaged reactors. If these leaks are not plugged within the next few years, eventually, the radiation will migrate into all areas of the world’s oceans and contaminate everything. We hope that Japan can solve this problem. In the meantime, you can feel confident that we are carefully monitoring for the potential appearance of any radiation levels in Seagate’s Seaweed product. © 2019 Seagate World|P4 Photo Blog by NetRivet, Inc.